We are delighted to once again be in the midst of prom season and are having a fabulous time helping the prom girls pick out their prom dresses and accessories for their big night. As ever, we like to do our best to be helpful, so this year we have collated together the hottest trends for Prom 2015. Backless dresses have always been particularly popular on the red carpet, and last year was the year the style trickled down to prom. This year is no exception, so you can expect to see dresses dipping low, low, low in the back at prom. If you want to keep an elegant air about you when you wear a backless dress, make sure that you have a high neckline, and you don’t over do it with the accessories; remember that the back is the key feature of this dress, so don’t make your back compete for attention. This particular style lends itself easily to the classic up-do hairstyle as it keeps the back clear and draws attention to the hair. The key issue with backless dresses is to make sure that you don’t have your bra on show. If you are not confident enough to go braless, go for a stick on bra which will give you support whilst giving you the ability to wear your backless dress with confidence. This elegant red backless prom dress (pictured right) has a classically high neckline and a low, dipped back with gorgeous sparkles encrusted at the base of the back, neckline and straps. The train offers that little bit extra so you can feel like a Hollywood starlet when you go to prom. Whether it is all encrusted or a light scattering of crystals, bling is big for spring! Bling bling dresses have gained almost iconic status on the red carpets, and again, you can expect to see dresses twinkling and shining at Prom 2015. Dresses with crystals and sequins look and feel glamorous and are a super way of grabbing attention for that ‘all eyes on you’ grand entrance. If you are going to be wearing a dress with fully encrusted crystals, be mindful not to go OTT with the accessories or you may run the risk of ‘over-bling’. Instead opt for subtle pieces of jewellery which compliment the dress, not compete with it. If you are going for a light scattering of sparkles, you can wear slightly heavier jewellery to bring out the shimmer and shine of the dress. As with all accessories, go for the same shade of shine as the crystals or sequins to accent the dress. This truly enchanting, blingy fishtail gold princess dress (pictured left) is the epitome of ‘look at me’ glamour, wear this dress with simple drop earrings and a simple and elegant bracelet, let the dress to the rest of the talking! 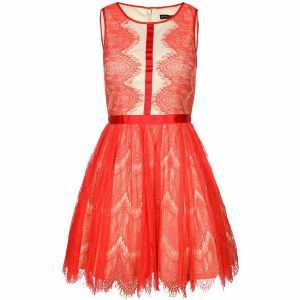 Lace dresses are ideal for girls who like a touch of vintage but want to stay contemporary. Alongside it’s timeless elegance, lace is also incredibly versatile, with an exciting array of colours and underlays of contrasting colours and fabrics. In short, the possibilities for lace is endless. We particularly like lace dresses to be fitted with a contrasting underlay of colour to ensure that the lace is shown off to it’s full potential. Pictured to the right is a lovely little skater style short lace prom dress which is trendy as well as having that touch of elegance with the red lace. Short dresses are absolutely brilliant if you are a shorter prom girl or if you want to dance the night away without the fear of treading on your dress. It also gives you the opportunity to show off your pins and your shoes! These dresses are daring, yet safe, see through, but kinda not! In short, these dresses add a touch of the risqué whilst remaining oh-so-elegant and sophisticated. The beauty of these dresses is that they tend to utilise that special illusion panel well and you will usually find that these dresses are embellished with embroidery or sparkle on the see through tulle. These embellishments give people the illusion of a decorated second skin and allows you to stay modest with a peep of skin. This stunning taffeta mermaid sheer mesh prom dress pictured to the right has the most beautiful embroidery creeping up the back with sparkles. This is ideal for those prom queens who want to do those much sought after ‘over the shoulder’ photographs for prom.